TheHindu Sci-Tech Compilation: What is EMF radiation? Role of NGO, Pressure Grp. Made new mobile app for women. Just by presing a button on the phone- the women in distress can send automatic message to nearest police control room. Then police can track the women based on her mobile location- send nearby PCR van etc. but What is Nirbhaya fund? This Nirbhaya fund has 1000 crore rupees- to support women centric projects by government and NGOs. With only 2 clicks of the power button, person can send SOS message to their guardian along with location on google maps. App keeps sending the message repeatedly every two minutes with new location updates. Limitation: Phone must have GPS+ internet connection. Only 1/3rd of Indian internet users are women. Google India came up with new project to get 50 million Indian women online by the end of 2014. Via a new website “hwgo.com“. This website will provide very basics of the Internet, special content for women like childcare, cooking recipes, household management etc . A pilot project in Rajasthan to train computer-net surfing to 1 lakh women. to protect websites against “distributed denial of service” (DDoS) attacks. is a live data visualization to map DDoS attacks across globe. shows real-time anonymous traffic data related to these attacks. let’s friends provide each other with a trusted pathway to the web- thus protects your net surfing from filtering, surveillance or misdirection. Camera has 15 lenses, takes picture every 2.5 seconds. 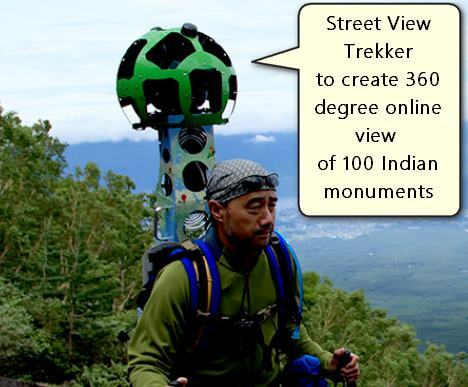 The images are stiched together with software= you get a 360 degree view of the location. For streetviews (under google maps) they mount this camera on top of a car. but @certain places like ancient monuments or natural sites, the car cannot go. and person has to take this camera on foot. including Taj Mahal, Khajuraho, Qutub Minar, Humayun’s Tomb and Ajanta and Ellora caves. will help people virtually visit those site. to celebrate the historical revolt of Rani Chennamma. She was queen of Kittur in N.Karnata, fought against the British in 1824. Janapada Kalavahini: Cultural procession showing traditional art forms of north Karnataka region. Ayyappan Theeyyattu is an age old temple art form from Kerala. Udayasthamanakoothu: performance of the art in full by a single performer that ends with breaking of 12,000 coconuts. Bidar is a city of Karnataka. In the 1400s, it was the capital of Bahamani kingdom. The “karez” water system= a complex system of aqueducts used for agricultural irrigation. ok but why in news? this has nothing to do with Sci-tech or Culture. but came across while going through Thursday newspaper. Department of Posts has given this separate PIN code — 110201 — for the Supreme Court of India. before this PIN: letter to SC=>sorting office => delivery post office=>reaches to SC. After: letter to SC=>sorting office=>directly reaches SC. Soon, Separate PIN codes for High courts as well. anyways back to the topic: IT topic. capacity: 524 teraflops but consumes 35% less electricity than other supercomputers of same capacity. This supercomputer has been ranked in the list of top 500 ‘Green’ supercomputers in the world. 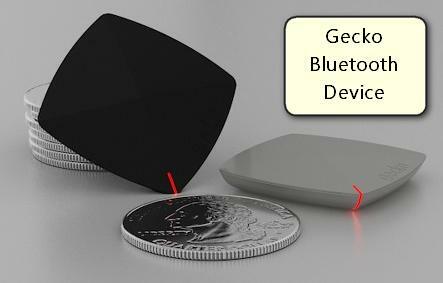 Gecko is a Bluetooth device- size just little bigger than a coin. by Banglore based startup company. it also has an accelerometer sensor – to detect motion. You can pair it with an apple or android phone/device. ok but what’s the use? Since it can detect motion- you put it in the doorknob- everytime someone opens door, it’ll notify you on phone. If someone opens door at odd hours- say 2AM, it can make your phone raise the burglar alarm. Why in news? because Apple’s co-founder Steve Wozniak gave funding. Another startup company- one of its founder from India- Pankaj Risbood. Zendrive aims to make driving better by using data from smartphone sensors. insurance companies can use its data to determine auto-insurance premium e.g. if person has erratic driving habit=more likely to accident=should be charged higher insurance premium. Similarly, Parents could also use the system to track their teenagers’ driving habits. Determining best route based on real time traffic data and so on. Why in news? Because Jerry Yang (of Yahoo) gave funding to them. This is India’s first and only car-sharing company (similar to Zipcar in the US). allows individuals to hire cars by the hour or by the day. Reservations are made through the website or through mobile. If you get in car accident- they coordinate everything with the police, insurance, and road-side assistance. Available only in Bangalore at the moment. Why in news? Because former US treasury secretary Larry Summers gave funding to this startup company. EMF is created when electric and magnetic waves travel to space together. for example: electricity supply, radio waves from TV, radio devices, medical devices mobile phones, radar and satellite communications. EMF strength is measured in units watt per square meter(W/m2). EMF radiation weakens very quickly as we move away from the source / antenna. EMF strength is inversely proportional to the square of the distance from the source. Similarly when distance 3times (3x), strength reduced to 1/9th. UV, visible light radio, TV, mobile phones etc. we can further classify electromagnetic radiation based on can they ionize (and hence damage) biological molecules? can’t break chemical bonds in body cells. can’t cause ionization of atoms and molecules. Observe following photo-From left to right: frequency increases and wavelength decreases. Observe frequency increases with new technology. Meaning wavelength must decrease. A mobile phone is two way radio. It contains a transmitter and a receiver. It emits electromagnetic radiation to exchange information with nearest base station. but the strength of electromagnetic field decreases rapidly as we move away from source- so we need to setup more and more mobile towers to have good connectivity. Unit of SAR = watts per kilo gram (W/kg) of tissue. Every model of mobile handset has specific SAR value. SAR matter falls under Department of Telecom. It is safer using a mobile from car because the car shields from the radiation. Mobile phone generates more RF radiation to overcome the shielding of car and reach the tower. so infact, using phone while in car=more harmful. mobile phone emits radiation only when you are talking with someone. As long as mobile is “on” it automatically transmits Radio frequency signal to check (poll) the network with nearest tower. it doesn’t matter where you’re talking or not. Mobile Base stations are dangerous and we should keep distance from it. We need to keep distance from the ‘antenna’ of base station.At the ground level, the radiation intensity is much lesser than @Antenna. Even Italians are more conscious about mobile tower radiation than India/China. Anyways, if a mobile tower operator doesn’t comply with this limit, he’ll have to pay 10 lakh rupees fine per tower. Telecommunications Engineering Centre (TEC) under Department of Telecom measures these radiation levels. Shorter the wavelength=more dangerous for body. UVA wavelength longest among 3 Majority of UV radiation coming to earth, is of this type. UVB medium As Ozone layer depletes, more and more of this UVB light incoming. It cannot penetrate beyond skin layer. Hence does all its damage to skin itself e.g. tanning, burning, skin cancer. UVC shortest among 3 but doesn’t reach earth’s surface. Most damaging- upto cell’s DNA. Artificial UVC lights used in food/medical/pharma industry to kill germs. PMA policy makes it mandatory for the government and private companies to procure a certain percentage of its requirements from desi manufacturers. This was opposed by American companies including Apple. And limit to the scope of PMA policy to only the supply of electronic and telecom equipment that has security implications. Most of the African countries are seeing political stability and better economic growth than ever before. Indian companies can create digital infrastructure for in e-governance, e-banking, e-learning- especially for maths+science. IIT Delhi actively involved in the training, particularly vocational training and training of teachers in some African countries. Nearly 30% Of Africa’s demand for CRT, picture tubes, inverters, radios, sound equipment, medical equipment, etc. is met from India imports. Indian government setting up IT parks and other ICT related activities in a number of African countries like Ethiopia, Senegal, Mozambique, Rwanda and Tanzania. you take a picture, send it to friend. it’ll automatically disappear from his phone after 24 hours. American teenagers like this. Mark Zukerburg (facebook) wants to bring them to facebook- hence offered 3 billion $ cash to snapchat maker, but he refused. Yahoo Lookflow=Yahoo bought this company, to provide image recognition facility in Yahoo’s photo website “flickr”Tumblr=Yahoo bought this blogging companyMarissa Mayaer=Yahoo’s female CEO. Rani Chennamma was the queen of Southern Kerala. Rani Chennamaa was a contemporary of Rani Gaidinliu. Both Rani Chennamma and Rani Gaidinliu had fought against the British. Bidar fort is located in Balasore, Odisha. Bahmani architecture is influenced by Persian style. SAR is the rate at which base tower receives signals from mobile phones in the given cell region. Discuss the significance of Information and Communication Technology (ICT) as a tool for empowerment and safety of women. Write a brief note about any five women freedom fighters of India- except Rani Laxmibai, Annie Besant, Meeraben, Kasturba and Sarojini Naidu. Get notified whenever I post new article! Dear sir metal act as as a reflector for radio wave because in case of metal the skin depth is zero . but in the SAR part you have mentiined metal is a good conductor of radio wave. Please correct me, if wrong. anybody from amritsar appearing in 2014……..??? ?